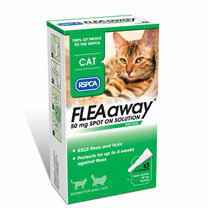 RSPCA FLEAaway™ spot-on treatment offers easy-to-use protection against fleas and ticks for up to 4 weeks. Contains Fipronil. Not suitable for cats less than two months old or weighing under 1kg.